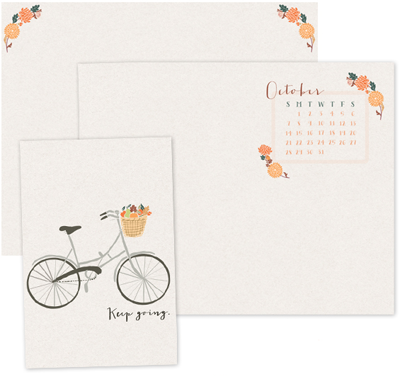 Get a charming little desktop freebie, with or without an October calendar, at Oh the Lovely Things. The designs are simple, just the way I like 'em, so finding files and folders on my desktop is easy. Plus you can't go wrong with bits of orange! That calendar on there would be nice! Tell her to watch out for cats. I remember flying through the air over the handlebars once when I braked suddenly for a kitty on the driveway. I love bikes! I love orange! I needed an October calendar! Thank you! What a perfectly simple and cute background! What a sweet surprise to be featured on one of my very favorite blogs! Thank you so much!